makes one pitcher of iced tea, but this recipe can easily be doubled or tripled; Note that this should be made at least 8 hours in advance for the best results. Optional flavour variations: Fruit flavours can be added for delicious and refreshing iced tea variations. Be sure to consider exotic fruits, too. You could add fruit juice or pureed fruit or sliced/chopped pieces of fruit (fresh or frozen) to your iced tea. You might want to try adding fresh herbs, such as mint, basil, arugula, lavender, or lemon grass, etc. Ginger is a great addition too. You could add a few slices of fresh ginger when you’re making your simple syrup. Get creative with your flavour combinations. 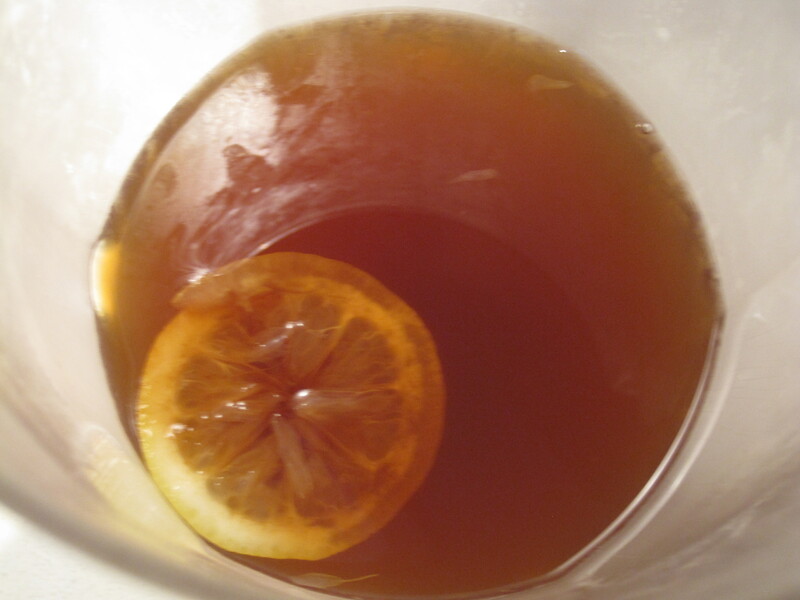 You might even want to turn your iced tea into an alcoholic beverage. Bring the 7 cups of water to a rolling boil in a kettle. Meanwhile, place a wooden spoon (to help cool down the hot water faster) and the tea bags into a large heat proof pot or bowl or pitcher. Pour the hot water over the wooden spoon and tea bags and allow the tea to steep for at least five minutes. Once the tea has reached the desired colour and flavour, remove the tea bags and discard them. Allow the tea to cool completely. Once it has, transfer it to a serving pitcher (if it’s not already in a pitcher). Add the slices of fresh lemon, fruit pieces/puree/juice (if using), and herbs (if using). Then chill the tea through in the refrigerator. Once the tea is nice and cold, stir in the simple syrup to taste. Serve the iced tea in glasses containing ice cubes or a few pieces of frozen fruit. This tea will keep for up to 3 days in the refrigerator. Remember to stir the iced tea prior to serving, each time. I’ve been drinking iced tea all my life , now, it’s hard since I have to cut back on carbs, but I am experimenting. Over the past couple of years I have been positively swooning over fruited iced teas, and found that a little fruit puree or fruit juice adds so much to it. Also, naturally-flavored fruit herb teas make splendid ice tea. Nice post! Question for you: I use rinsed, drained beansprouts for an egg foo young recipe. Can never seem to get them dry enough using colander followed by lots of paper towels Tried to get them dry on baking sheet in oven at low temp but still too wet and they shrank too much. Hi Lynne, nice to hear from you :). I am definitely still planning on blogging. A bad concussion has made it difficult but I will eventually get some new posts up. For the bean spouts question: the way that works for me is to rinse them ahead of time (a few hours) and drain them in a colander and place that in the refrigerator. If you leave them too long they will brown. I hope that works! Let me know!